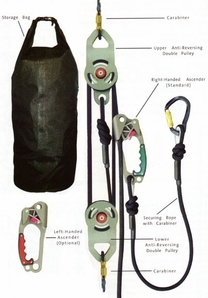 MSA's Suretyman Rescue Pulley System incorporates all the features professionals have come to expect from a first class rope rescue system, made by the leader in fall protection equipment, Mine Safety Appliances (MSA). Rescue System 10093608 is primarily used for raising and lowering people or equipment in rescue and industrial work access and is ideal for confined space applications. PLEASE NOTE: Due to the 4:1 mechanical advantage the SuretyMan Rescue Utility System 10093608 offers a working length of 125 feet(38.1m).